This is a lovely salad: bright, refreshing and with a unique mix of flavors and textures. Juicy, sweet-tart grapefruit is balanced by peppery arugula, creamy avocado, and crisp, aromatic fennel. It's great for cleansing the palate and aiding digestion alongside or after a heavier main course. The grapefruit juice, mixed with some olive oil, becomes the salad dressing. 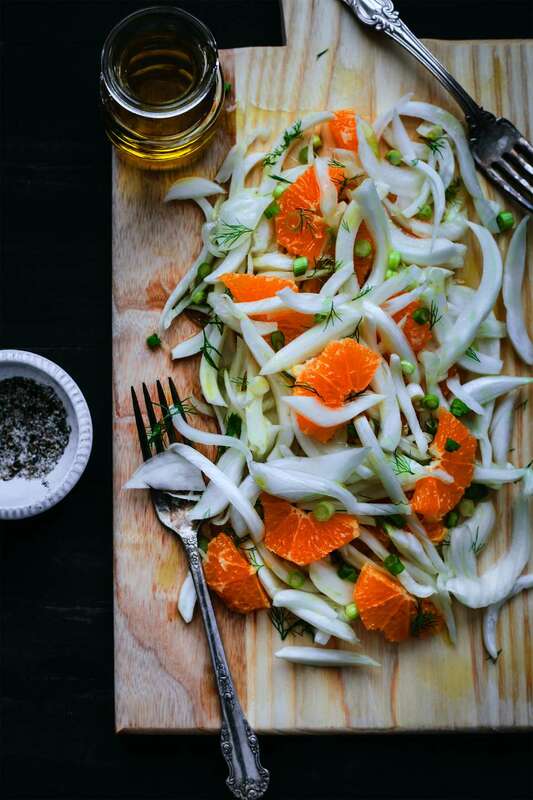 I first tasted grapefruit and fennel together in a salad at a pizzeria and instantly fell in love with the idea. I kept making different versions of it over the years and the one below is now my general go-to recipe, though I often add beets as well. You can take this basic idea and come up with variations depending on your fancy or whatever happens to look good in the market that day. Wash and dry the arugula thoroughly. Cut the stalks off of the top of the fennel bulb (retain some of the feathery fronds for garnishing the salad), slice off the tough root end of the bulb, cut the bulb in half lengthwise, and slice into thin strips. Cut the grapefruit into segments without any peel, membrane, or white pith attached. These are called suprèmes. Be sure to retain any juice released during cutting and to squeeze the leftover core to get the juice out of that as well. You will need it for dressing the salad. Peel the avocado and slice it lengthwise into thin segments. Slice the the dark green part of the scallion into thin pieces (about 1/4 of an inch thick). Thoroughly whisk the retained grapefruit juice together with the olive oil and salt and pepper to taste. Toss the arugula and chopped scallion lightly in the dressing, then divide it evenly between 4 servings bowls or plates. Arrange fennel and avocado slices and grapefruit segments on top or around each serving of arugula. Garnish with finely chopped fennel fronds (from the stalks). Substitute the grapefruit with blood oranges or regular oranges. Substitute the arugula with watercress or any salad greens. Add toasted pine nuts or walnuts, roasted beets, or pomegranate seeds.